What is a thermal spa pass? Visiting the spa when cruising can be the ultimate chance to relax. Asides from the more traditional spa treatments many cruise lines also offer ‘thermal’ spa passes. These give you access to all of the steam rooms/saunas/showers/pools in the thermal area which you can enjoy at your own pace. Most cruise lines have spa passes available to purchase either by the hour or by the day. 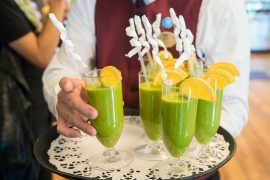 The current cost on the MSC Meraviglia (March 2018) is €16 an hour or €40 per day. 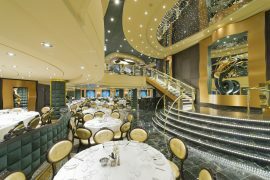 I was lucky enough to cruise on the MSC Meraviglia over Christmas. I had a free hour in the thermal area because I matched my loyalty status from NCL to obtain a ‘black’ voyagers status on MSC. I loved all of the free loyalty perks but the hour in the spa was one of my favourite. 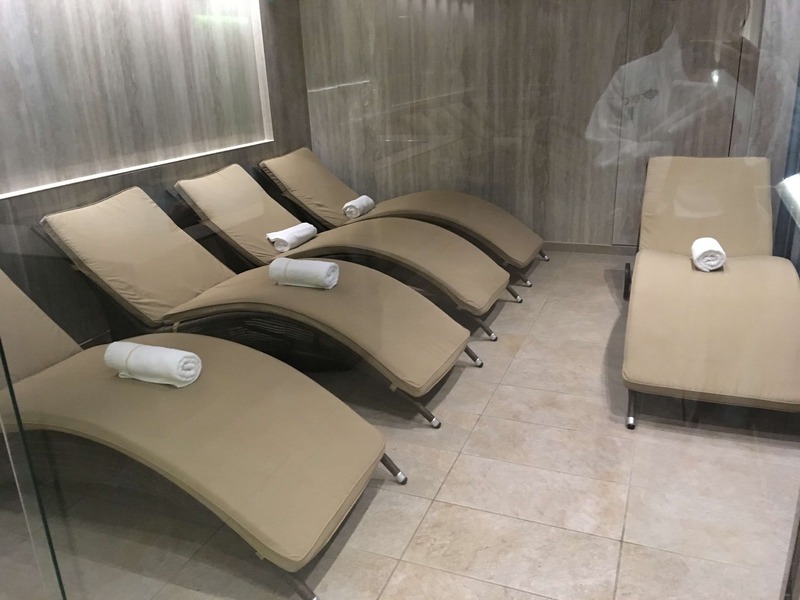 I had never been in a spa onboard a cruise ship before but I’m really glad that I took the time to visit the spa onboard the Meraviglia. 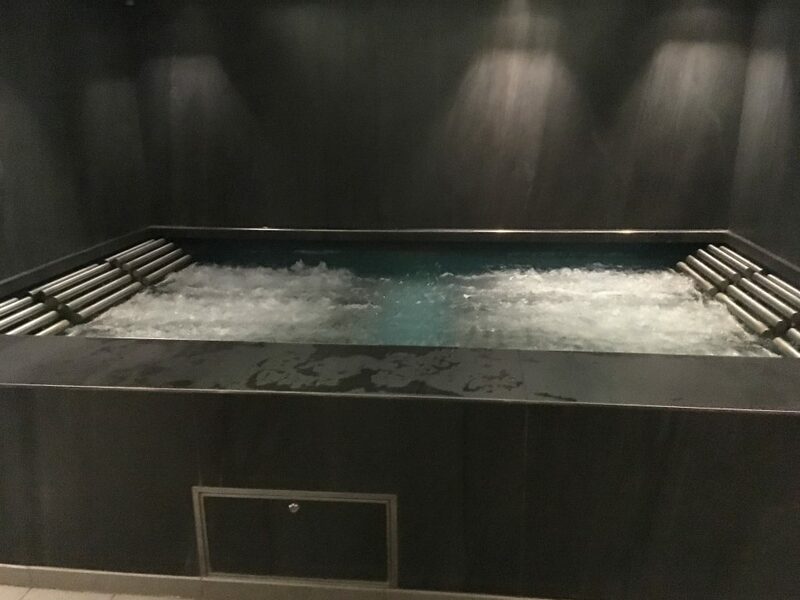 The spa is made up of a variety of steam rooms, bubbly pools and cool scented showers! 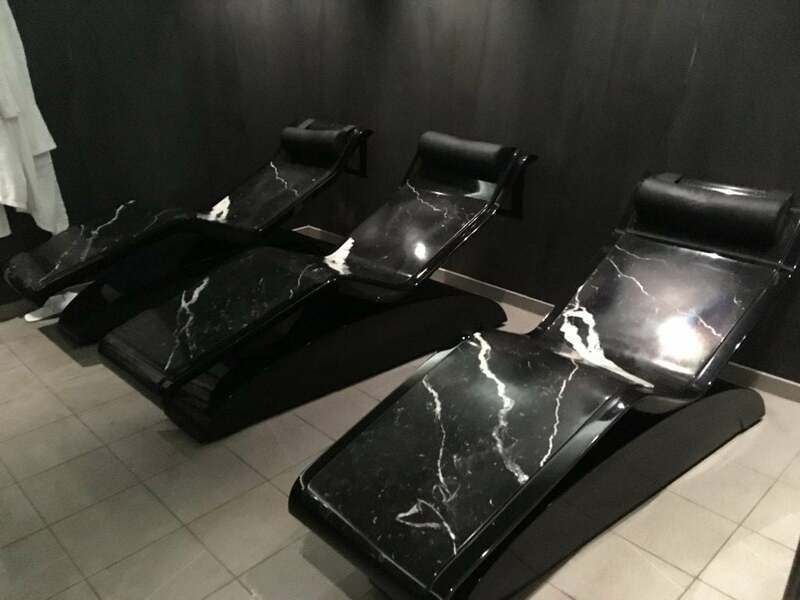 The first thing that you will see when you enter the spa is the quiet room. This room isn’t wet and isn’t particularly warm. Nevertheless, a good place to relax. I imagine you’d use this when entering the spa or getting ready to leave. Apologies that I don’t know the actual names for these things. I think bubbly pool sums it up about right… This one was lovely and warm. I imagine it’d be a bit weird to sit in it with 5 strangers though! Not sure. Next to the bubbly pool are these heated seats. I particularly liked these and would love one in my home. It’s currently snowing in the UK at the time of writing this and I would LOVE this to warm up on. This ‘pool’ is the biggest in the spa. It’s basically a giant hot tub. It was the most popular part of the spa and most of the time was full. Max and I did manage to get it to ourselves though. All of the bubbles make you float around which is pretty fun. At the back of the room, there is another quiet room. Similar to the first one. Can you see me in the reflection? Sporting a lovely bathrobe! 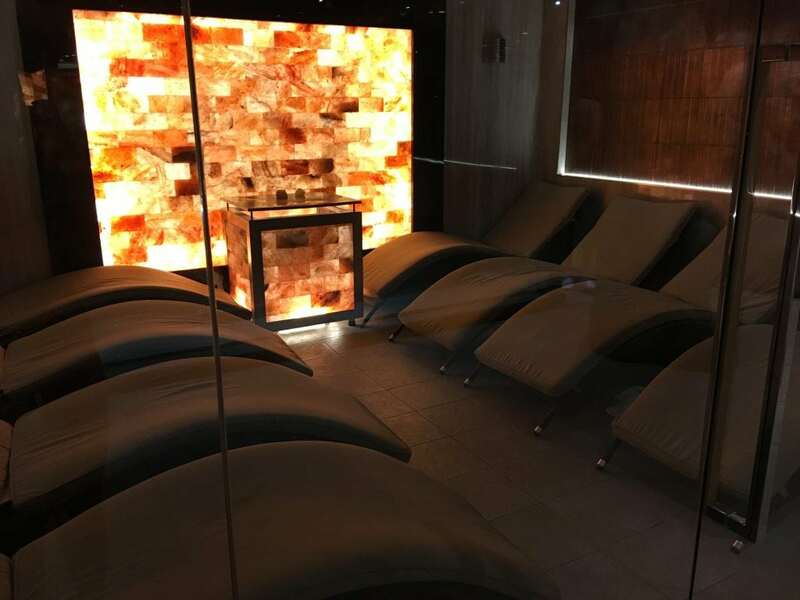 There are a number of steam rooms and saunas. I don’t have any photos of these because they’re usually dark but I can assure you that they are there! Each with their own colour theme and some with different scents. Because we only had an hour in the spa we ran from room to room making sure that we experienced everything. Once you have spent nearly an hour warming up, it’s time to take a cold shower! They have a number of cold showers, again with different light themes and scents. I chose to take a shower in the ‘cold storm’. It was SO cold. There is no way that I can describe in words how cold it was, it’s better just to show you. Skip to 7:00 if you just want to see that part. Lots of other worthwhile tips in the video below though, I would love you to watch it all! Please also consider subscribing. I would definitely recommend a trip to the spa. It’s a great way to relax before dinner or in the evening. I’m not really a ‘spa person’ but I had a great time. It should cost €16 an hour which I don’t think is too crazy! We, however, got ours free by matching our loyalty status from NCL. I’d definitely recommend looking into this if you have a loyalty status on any other cruise line. More about that here! 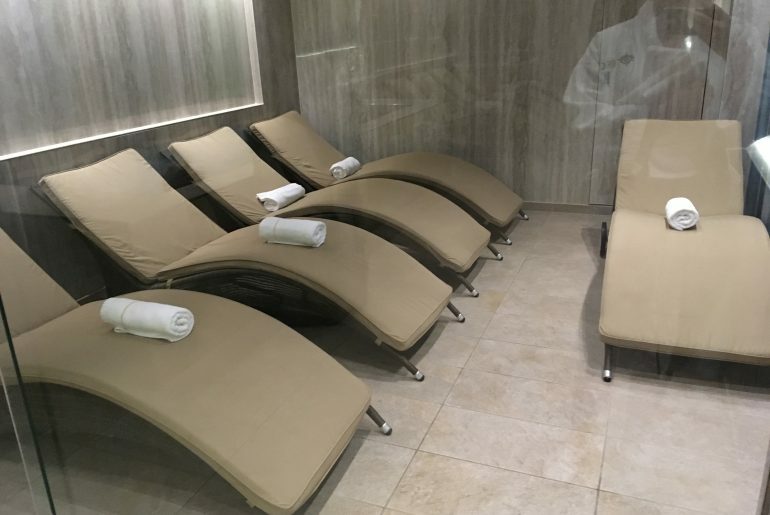 If you’re considering a cruise on the MSC Meraviglia please do check out the Meraviglia section of our site here: MSC Meraviglia.